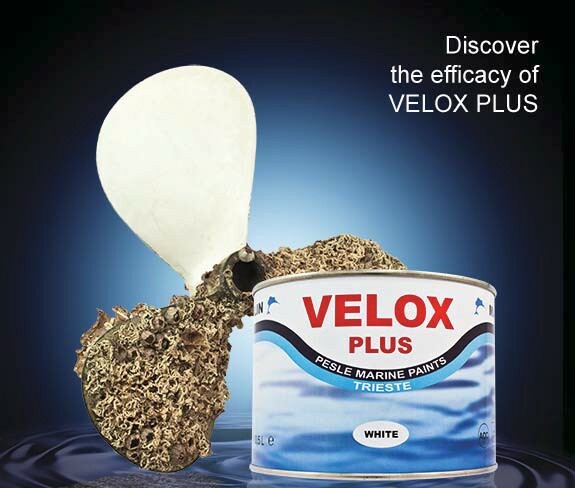 VELOX PLUS is an antifouling paint suitable for protection of propellers, stern drives, shafts, trim tabs and other metallic parts permanently immersed. It is not degraded by galvanic currents that are responsible for paint detachment. Approximately half as much primer is required for application as compared to paint. Velox Antifouling Paint White 0.25LVelox Antifouling Paint for PropellersVELOX PLUS is an antifo..
Velox Antifouling Paint Black 0.25LVelox Antifouling Paint for PropellersVELOX PLUS is an antifo..
Velox Antifouling Paint Black 0.50LVelox Antifouling Paint for PropellersVELOX PLUS is an antifo..
Velox Antifouling Paint White 0.50LVelox Antifouling Paint for PropellersVELOX PLUS is an antifo..
Velox Antifouling Metal Primer 0.25LVelox Antifouling Paint for PropellersVELOX PLUS is an antif..
Velox Antifouling Metal Primer 0.50LVelox Antifouling Paint for PropellersVELOX PLUS is an antif..